FAIRMONT, West Virginia. 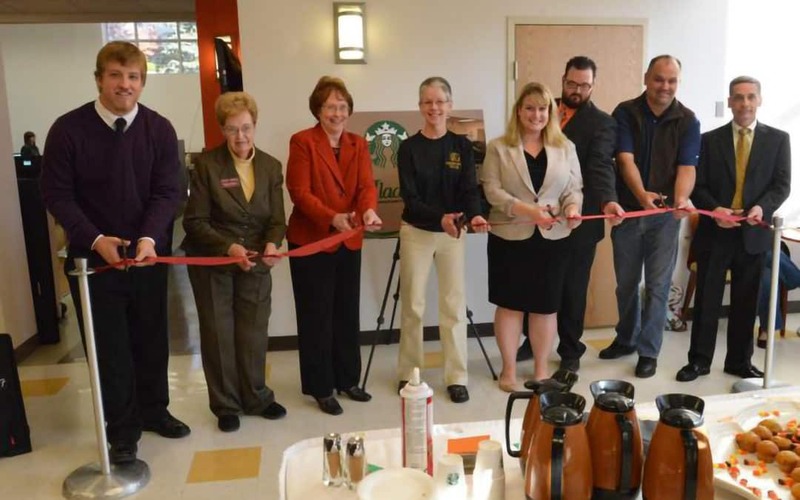 (November 5, 2013) – A ribbon cutting ceremony on Tuesday, Oct. 29, celebrated the renovation and expansion of the Starbucks located inside the Ruth Ann Musick Library on the shared main campus of Fairmont State University and Pierpont Community & Technical College. Because of its growing popularity in the campus community, the Starbucks in the Ruth Ann Musick Library has been redesigned, renovated and expanded. The project completed this fall included the demolition of the existing coffee shop area. The design was revised to improve the customer experience and make the space more functional for employees and equipment. During the ceremony, Paul Kowalczyk, Regional Vice President of Operations for Aladdin Food Management Services, presented FSU President Maria Rose and Pierpont President Doreen Larson with a $20,000 gift to go toward the construction project. Construction included all new cabinetry, countertops, a lockable storage room, flooring, lighting, plumbing fixtures, new paint scheme and an open box ceiling grid. The project was completed by The Thrasher Group and Lombardi Development Co. in coordination with the campus Physical Plant. New espresso machines, Starbucks water softener, fridge units, blenders, a self-serve case and an ice maker were purchased. The renovation also includes a new separation wall to define the coffee shop space and create more seating options. New furniture for inside the Starbucks area and the outside patio was purchased. Menu options also have been upgraded to include specialty drinks, sandwiches and salads. During the event, guests were invited to sample new specialty drinks and enjoy light refreshments. Students participated in a door prize drawing.